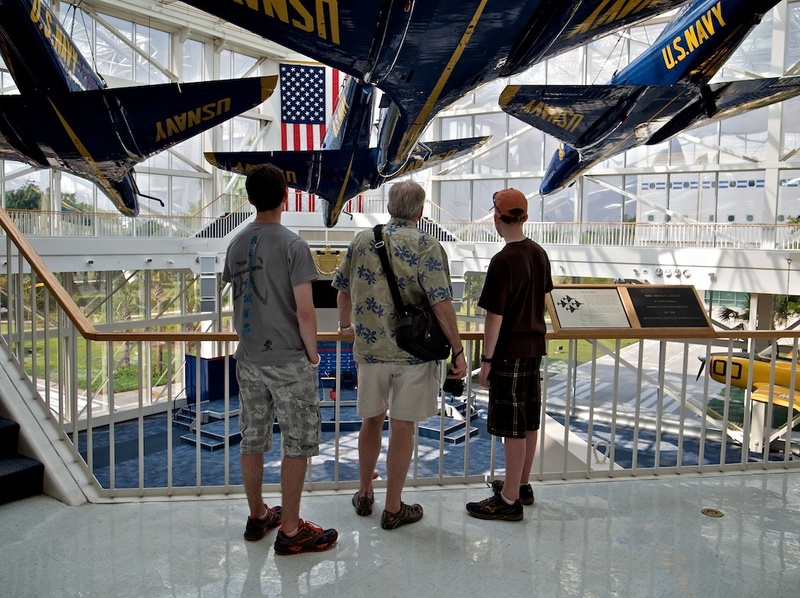 One of the reasons we enjoy coming to the NAS Pensacola RV campground is the Naval Aviation Museum that’s here. Its really an incredible place. In the main atrium as you can see in the photo below is they have the previous aircraft the Blue Angels flew, the A-4. This is the aircraft I flew while in the Marine Corps, VMA-311, and the first squadron I flew in when I transferred to the US Navy, VFC-13. I have over 2,000 hours in the different types of this aircraft and it brings back great memories when we come here to visit. My wife has taken a picture from this stance each time we’ve come. The only changes have been the color of my hair and the size of our two boys next to me. This entry was posted in Aviation, Photography, Ricoh GRDIII, Travel and tagged A-4 Skyhawk, Aviation, Blue Angels, Color Efex Pro 4.0, Naval Aviation, Ricoh GRD III, Travel. Bookmark the permalink. Thanks Zandre, when I get a few minutes I should post the past photos for comparison!